Migration of files in one format to another format (from a different format family) can damage the content of the file. Explanation by A. 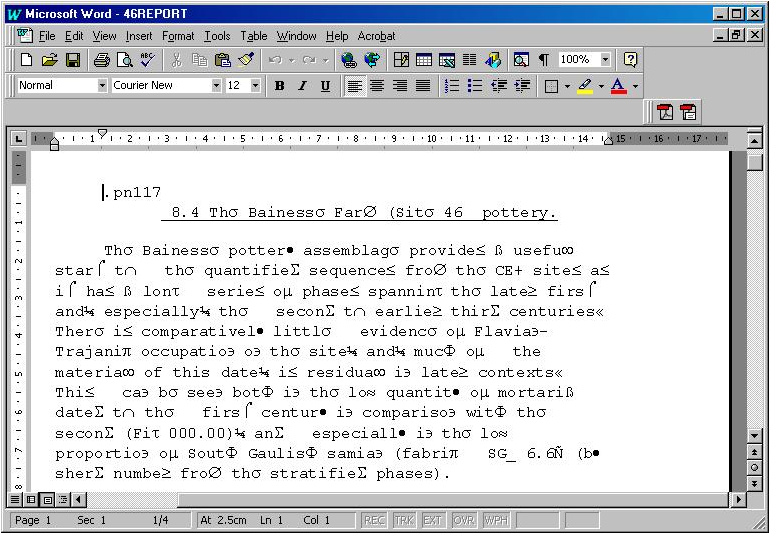 Brown of Parliamentary Archives UK: “The images arose from some experiments carried out in the late 1990s into migration, as we had a large archive of Wordstar documents, and our current desktop software was MS Word 97. 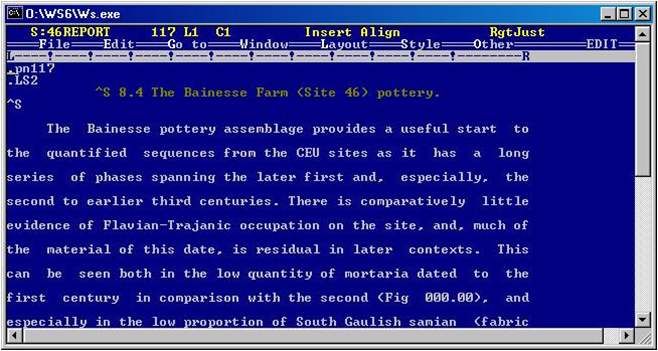 Word at the time provided an add-in, giving extra filters for opening and saving in a wider range of formats than was provided as standard (as far as I’m aware, support for Wordstar was removed altogether in later versions of Word). For this experiment, I simply installed the add-in, then opened the document in Word, and subsequently saved in .doc format. Before migrating files, it is essential that a test of the migration shows that no information is lost or unintendently added. In this case the experiment with the tool made the outcome clear. We’ve been working on this issue at the National Library of New Zealand in recent months. I would argue that this is not digital damage, its an example of opening a binary file with an incorrect decoder…. If the WS file is being decoded correctly, you would see a very different output. There is also ongoing issues with MS Office removing . changing legacy decoders that extends the problem if want to try and move from WS directly to .doc. Good comment Jay. It’s the decoder/converter that of course makes all the difference. As you say, MS used to include a bunch of converters and now the typical user needs to go through hoops to get them. Another probem with early versions of WordStar is that tabbing was implemented by the program inserting spaces, so most conversions just left them in, and if the fonts didn’t match exactly, the lines would wrap at different spots than the original.